Setup halts and rolls back with an error "Feature Transfer Error -1603" and will not complete. In order for WebAdvantage suite to install successfully, it requires that IIS 6.0 or later is installed. Installation attempts to enable this if not currently running, however IIS may need to be installed and setup manally. In some cases after installing IIS 6.0, the system may need to be restarted before IIS will function properly. Windows will not indicate this. In addition to being installed, WebAdvantage Suite requires that Web Service and Default website components of windows be running and fundamentally in good health. To help verify that IIS is installed and running, you can check services and ensure it is started. If it is listed but will not start: consult Microsoft Knowledge base and other support resources for resolution of these Windows issues before installing WebAdvantage. In addition to being installed, WebAdvantage Suite requires the IIS be functionality correctly. The best test of this is to ensure that the “Default Web Site” is running successfully. To help verify that IIS is running properly, you can follow these steps to ensure the default website is running correctly, and IIS portion of Windows is operating. b. Ensure Default Web Site is listed under Web Sites, and that it shows started. Browsing the site will usually show an Under Construction page. 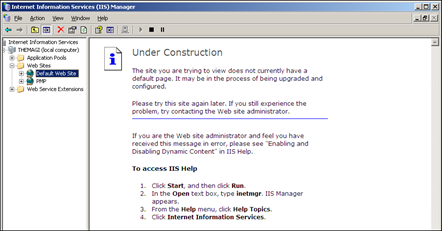 This typically means that the basic IIS functions are running. Often good internet searches of the details from error messages can help find unofficial resolution to issues, usually posted by other users.